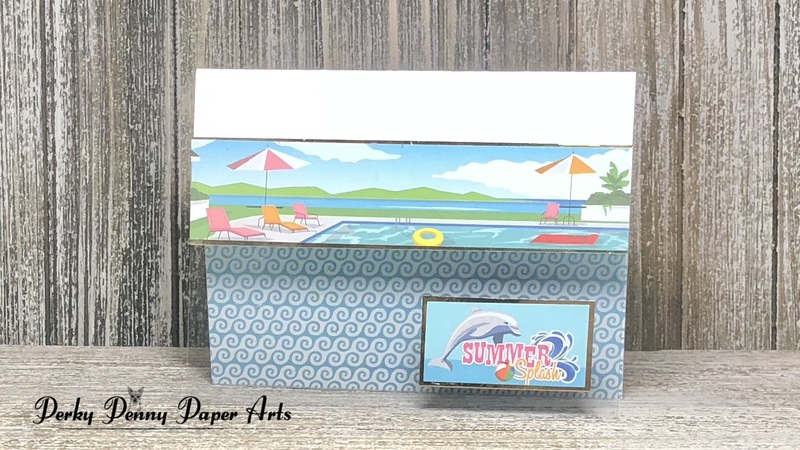 Today I am sharing a new way to create the ever popular Pop-Up Slider card by using the Lawn Fawn Shadow Box die. Follow along with this video as I take you through the process. You will find all of the measurements for the basic card below the video (on this blog) and a supplies list at the bottom of the page so you can see all that I used to make the card. I've also created many other cards with the Shadow Box dies. Here is a video I did late last year. Have you ever used a die for something other than its original purpose? 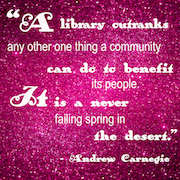 Tell me about it in the comments below. I always love to learn new tricks. I'm off to create some more fun projects. 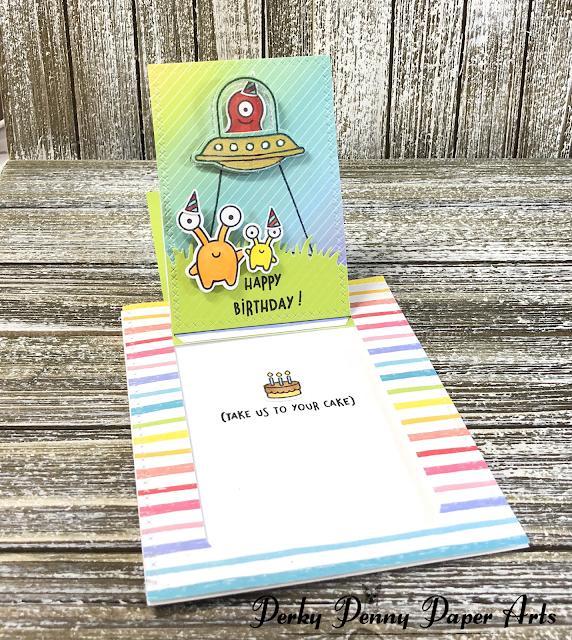 Super fun July Card Kit and June release for Simon Says Stamp. I hope you enjoy these cards I'm happy to say that there are four guy cards in this mix. Yay!!!! Winning!!!!! 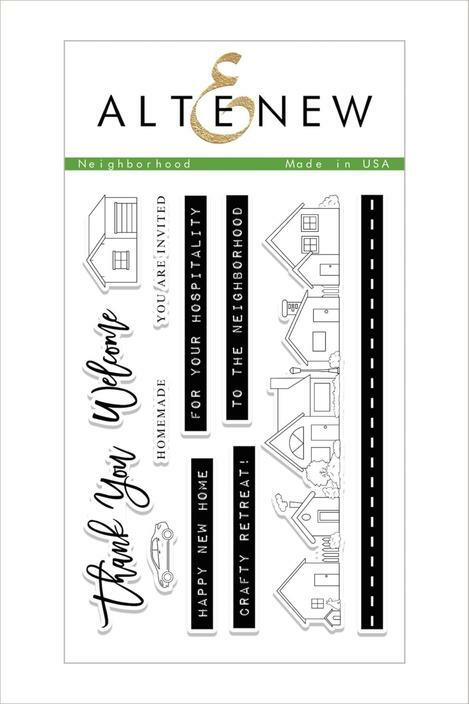 Be sure to check out the video and the supplies list below for all the information regarding these cards. Unfortunately the kit has sold out but the great thing about Simon's kits are that all of the products are available for purchase separately. Check out this video for additional information and a giveaway. I started by sponging the SSS Jazz Dance stencil on white card stock with SSS Lemon Zest ink. I then took the circle stamp from the kit stamp set and used the Lemon Zest ink to stamp some random circles around the page. 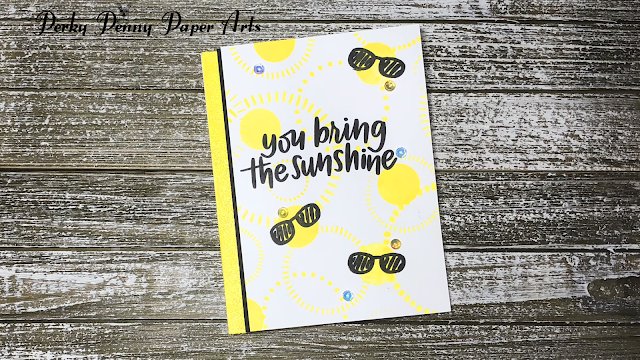 I used Versafine Onyx Black ink to stamp some sunglasses on a few of those circles and then stamped the sentiment in the Versafine Onyx Black ink. I then trimmed this piece down to 4 7/8" x 5 1/2". To add some shine I took Nuvo Moonstone Glimmer Paste and added it to a 1 1/2" x 5 1/2" strip of the yellow card stock included in the kit and let it dry. This created a beautiful bright yellow shimmer paper that would coordinate with my stenciling. I secured it to the left side of the card base with some tape runner. To make the front panel pop, I added a sliver of black along the edge of my stenciled panel on the same side as the glimmer paper. I applied some of the Sizzix adhesive foam included in the kit on the back of this panel and then attached it to the card base. A few sequins and this card is done. 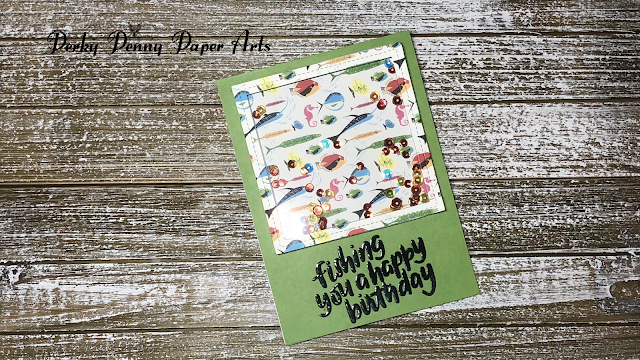 You could easily make several of these cards from this kit as the patterned paper has four of these cute little scene strips on one of the pages. Another piece is full of adorable sentiments, two of which you will see on the next two cards. I cut half of the A2 card front away and then placed an A2-sized panel of acetate to create a see through bottom of this card front. I used the cut away piece to cover the adhesive on the top part. I then placed a piece of the fun scrolling waves paper on the inside of the card. It was a little bit taller than the acetate opening and 5 1/2" wide. I bordered the scene panel with gold on the top and the bottom and then made a gold mat for the sentiment. I popped up the sentiment with foam square and applied another small rectangle of white behind it to hide the foam squares. The result is this super cute and crisp card. Great for celebrating the summer. I didn't want to cut this paper -- it is just so pretty and realistic looking -- so I decided to try something different. I used my paper trimmer to cut along the edges of three of the planks leaving them intact at the end. I stamped Happy Birthday (from the SSS Birthday Messages stamp set) and heat embossed in gold, a on the center one of those panels. I attached the panel to the front of my A2 card base using tape runner on the uncut panels and some foam tape on the cut panels. It just adds a smidge of interest. Perfect for a guy's birthday card. 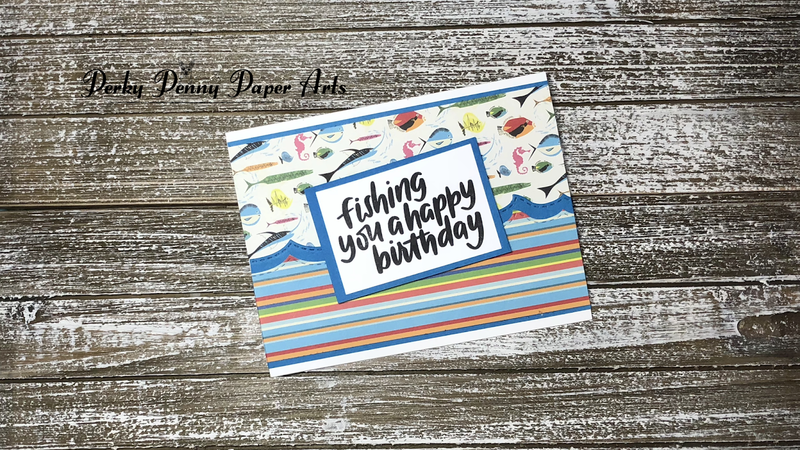 The papers for this card are: an A2 card base; 2" x 3" piece, 1" x 5 1/2" piece, and two slivers of the blue card stock; the remaining fish paper trimmed down to 5 1/2" x 2 1/4"; and 5 1/2" x 2" piece of the striped paper. 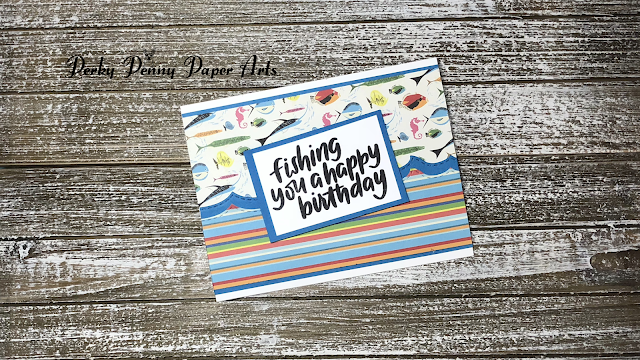 I used one of the Ocean Waves Die-namics dies from My Favorite Things to cut the blue and striped panels. I glued the blue to the back of the strips leaving about 1/2" or so reveal at the top. I then put one of the blue slivers at the bottom of this piece. I took the fish panel and put the other blue sliver at the stop of it. I adhered the fish panel and then the striped panel, overlapping to create a 1/4" white border on the top and the bottom of the card. I stamped the sentiment on white card stock in black ink and trimmed it down to 1 3/4" x 2 3/4". I placed it on the blue mat and added foam tape on the back and placed it at an angle because of the rocky seas. I always like to create at least one 6" x 6" card with each kit. 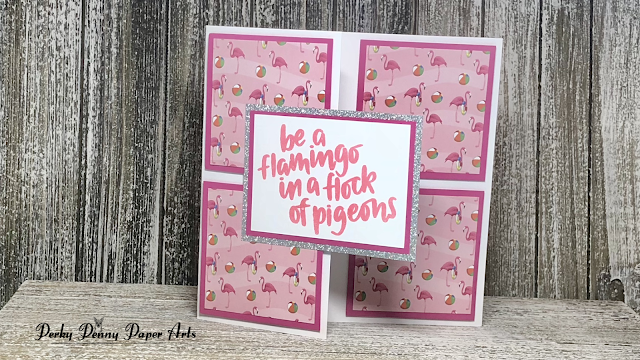 I took advantage of the pretty pink flamingo paper and the "be a flamingo in a flock of pigeons"sentiment from the One Cool Pineapple stamp set to create this one. I took a 6" x 6" card base and cut off the front half of the card. I then took the flamingo paper and cut 4 - 2 1/2" squares. The mats are the pink card stock that was included in the kit and I cut 4 - 2 3/4" squares from that and a 2 1/2" x 3 1/2" rectangle for the sentiment mat. 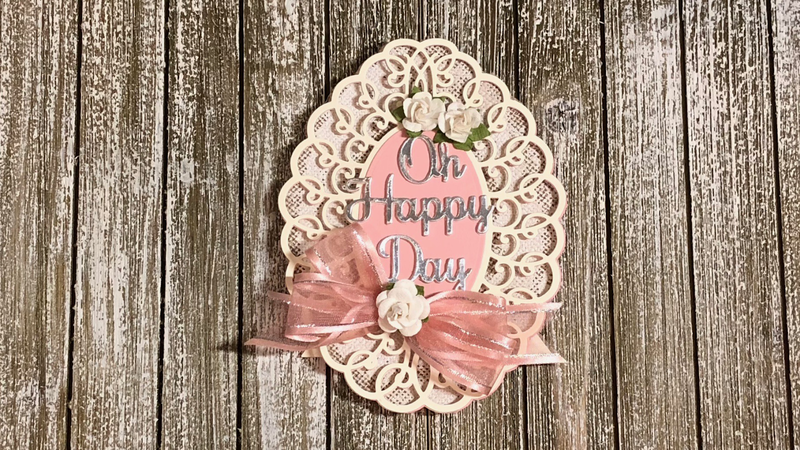 The white sentiment panel is 2 1/4" x 3 1/4", and the sentiment is stamped in Versamark and heat embossed with Hero Arts Pink embossing powder. I attached all of the patterned paper to their mats and then adhered them to the front of the card with foam tape. I attached the sentiment to its mat and then, to add some shine on the front of the card, I put 2 3/4" x 3 3/4" silver glitter paper behind it. I used Nuvo Deluxe Adhesive to attach the sentiment to the left front of the card. I love the sticker pack in the kit and really wanted to play with the shine of them. I used a piece of acetate on the front of my card which made the entire piece shiny and did just the trick. I cut an A2 sized pink frame using the Lawn Fawn Stitched Rectangle Frames and then put it on an A2 sized panel of clear acetate. I then centered three of the butterfly stickers, a banner, and a sentiment from the sticker pack to the front of the acetate. I used a piece of gold and white patterned paper from my stash as a background that I centered on the butterflies. All of this was added to the front of an A2 card base. My third and final Pinky card is this card I created using the newly released Hibiscus Frame Wafer Die from SSS. I started by no line watercoloring the flamingo from the kit stamp set. I stamped the image, in Distress Tattered Rose Ink, on Bristol Smooth card stock, and then used a variety of pinks from my Zig Clean Color Real Brush marker stash. The exact colors are listed below. I then cut out the flamingo with its coordinating die as well as two others in white. I glued the decorated flamingo and two white pieces together to create a nice sturdy flamingo. I then took a top-folding A2 card base and cut out the hibiscus frame. Separately, I took some pastel yellow glitter paper and cut the flower stamen out and again two white ones and did the same thing as I did for the flamingos. 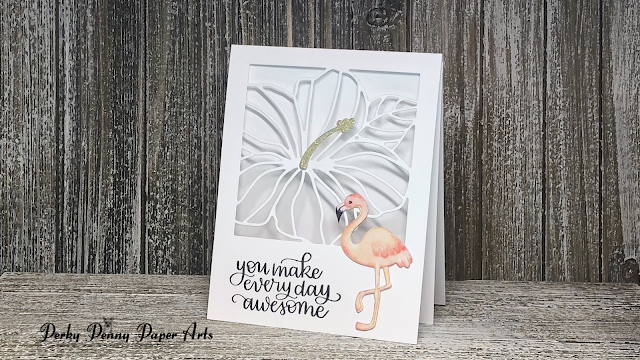 I stamped the sentiment from the Handwritten Encouragement stamp set from SSS in black Versafine ink and attached my flamingo and stamen to the card with Nuvo Deluxe Adhesive. The issue with this card, once completed, was that there really was no place to write a message inside the card without it being seen from the outside. I really wanted the front to remain unattached, and clean so this is the solution I came up with. I took an A2 card panel of the same white card stock and scored, folded, and burnished it at 1/4" from one of the 4 1/4" sides. This side now becomes the top. I applied 1/8" score tape along the 1/4" area as it is folded back so that I can use it to attach this piece to the back of my card interior. This is demonstrated in the video so be sure to check there for a good visual of what I mean. This worked great and now the card can be displayed with any message hidden privately behind the inside panel. I took the pretty retro floral paper and cut an A2 sized panel from it. I then cut the Good Vibes background out of the center. 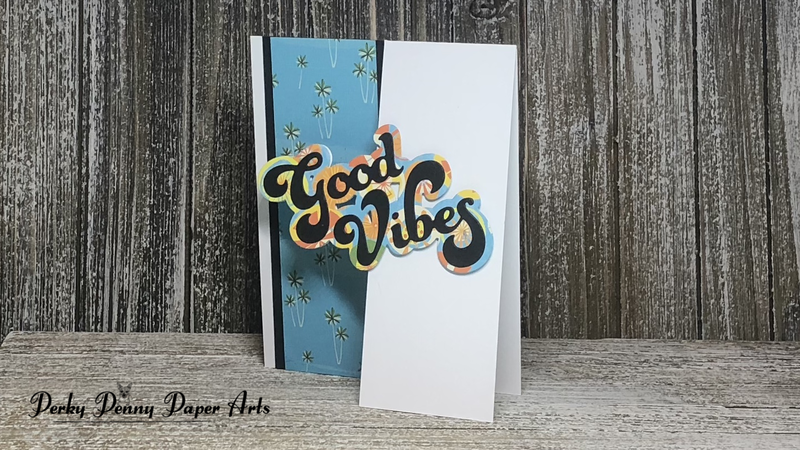 I adhered it to the front of my card base and then die cut the Good Vibes background out of the card base as well. I die cut 3 yellow (from the kit) and 2 orange of the Good Vibes and glued them together alternating between the yellow and the orange. I then glued them inside the card to show through the center and added a few sequins and this card was done. On this card we use the sentiment as a handle to open the card. 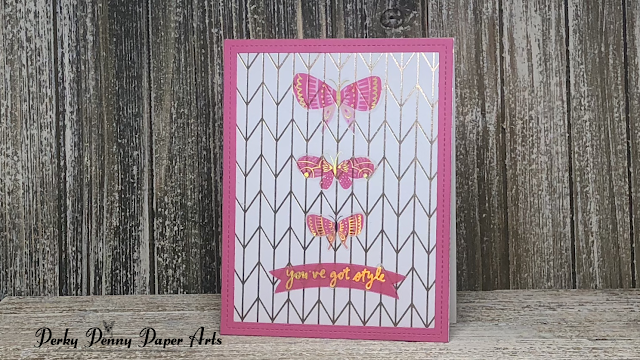 I created this card base by taking a top folding A2 card and cutting half of the front away carefully with my paper trimmer. To decorate it, I used the remaining paper from Card #10. I cut a 1 3/4" x 5 1/2" strip of the patterned paper and adhered it, with the opposite side showing, to a 2" x 5 1/2" piece of black card stock. I then took the sentiment background from the other card and placed the words on top, die cut in black. I also die cut the background in white. I applied foam to the back of the patterned piece and then adhered it to the front right panel and immediately put the white backing behind it so it would cover the sticky on the left side. I created this shaker card using the second largest die from the Lawn Fawn Stitched Square dies. I cut it out of foam and patterned paper. I then cut a panel of the green from the kit and acetate that was the same size as the frame. I created the shaker using the following steps. Attach the frame to the acetate using 1/8" Scor-tape. Attach the foam to the acetate using 1/8" Scor-tape. Attach the background to the green square making sure to center it. Place sequins (I used the ones from the kit) in the center of the background. Attach the frame piece over the background panel using 1/8" Scor-tape. I then used another piece of the green card stock for my card front. I stamped the sentiment in black and then heat embossed in clear. I finished by adding my shaker element to the card front. Well that is it for today's cards. I hope you enjoyed them and got some inspiration for your card making. • Simon Says Stamp FLAMINGO Wafer Dies sssd111858 at Simon Says STAMP! • Simon Says Stamp SUMMER GOLD Sequins sgsp18 at Simon Says STAMP! 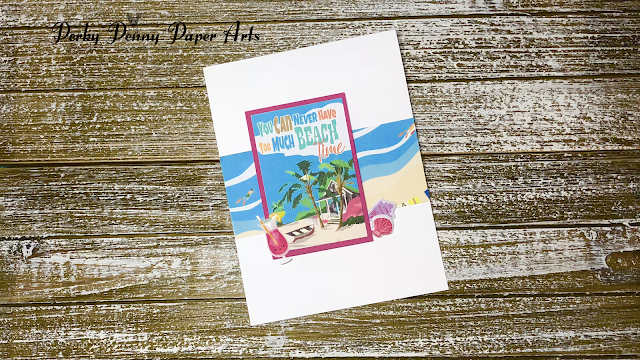 • Carta Bella SUMMER SPLASH 6 x 6 Paper Pad cbspl83023 at Simon Says STAMP! • Simon Says Stamp Card Stock 100# DOLL PINK DP17 at Simon Says STAMP! 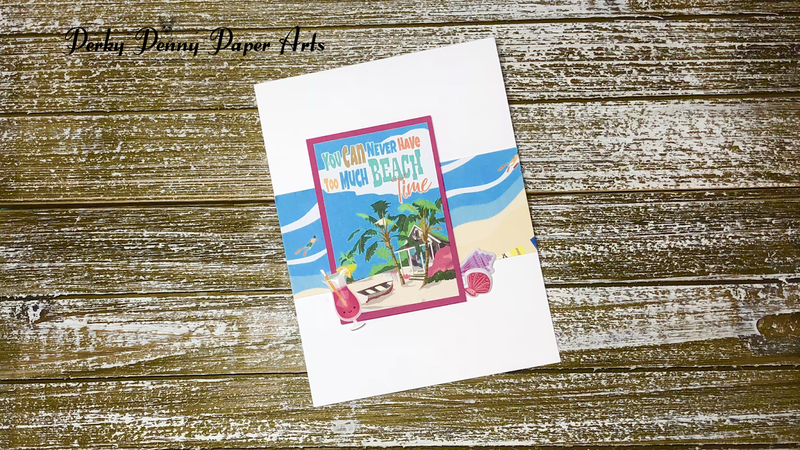 • Simon Says Stamp Card Stock 100# ISLAND BLUE IB12 at Simon Says STAMP! • Simon Says Stamp Envelopes DOLL PINK ssse11 at Simon Says STAMP! • Simon Says Stamp Card Stock 100# GREEN LEAF GL11 at Simon Says STAMP! 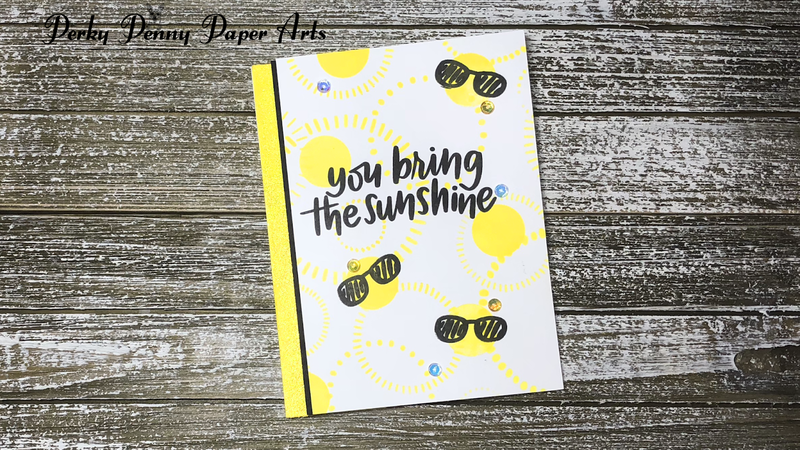 • Simon Says Stamp Card Stock 100# BRIGHT YELLOW BY34 at Simon Says STAMP! • Sizzix FOAM ADHESIVE SHEETS 4x6 663042 at Simon Says STAMP! • Hero Arts Nesting OVAL DIES DI337 at Simon Says STAMP! When the beautiful Sweetheart Swirl Etched Dies arrived in my mail, it took me just about half an hour to come up with this idea. I live in Texas and burlap and lace are huge for weddings. 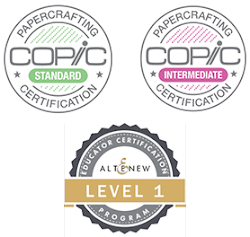 With the dies, I happened to also get the Burlap and Canvas Platinum Products that are made to be cut out with the thicker steel rule dies. I decided to give them a whirl with my regular dies. The fabric pieces didn't fair so well but the burlap cut like a dream. And the coolest part is that it is burlap so it also gives off the smell of burlap to add to the experience. This card is all about the little details. I started by taking my burlap piece and smearing (with my fingers) some white acrylic paint over it for a shabby chic feel, and then set it aside to dry. My lace consisted of some natural card stock cut with the detailed die from the Sweetheart Swirl dies. I cut two out of the natural and one out of the pink. I will show you what for later. I created a card base out of pink with the outline die and folded the top portion in half to create an easel card. I certainly want this card to be able to be displayed. I also cut the center oval out of the same pink card stock. 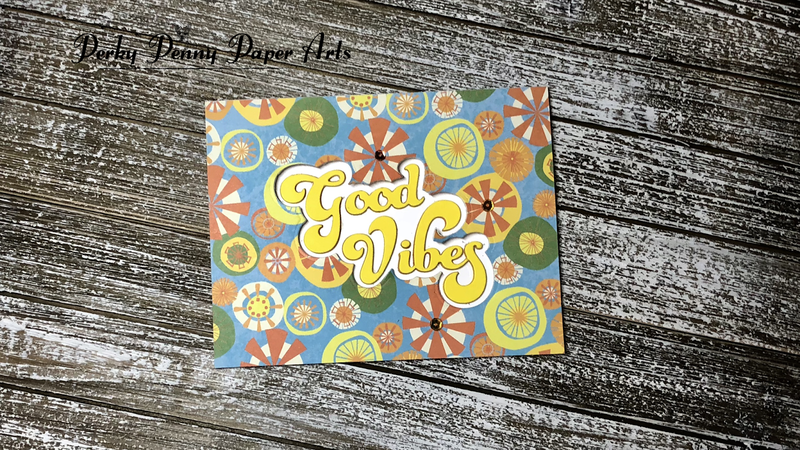 I decided for my sentiment, I would use the Oh Happy Day stamp and die set from Spellbinders. 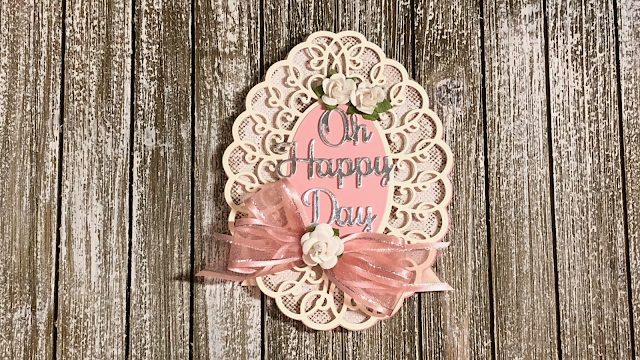 I cut one set of the Oh Happy Day dies from Tim Holtz Metallic Kraft paper (silver) you have seen in other projects and four additional sets out of the natural card stock to stack and add to the silver version, to pop it up on the front of the card. I die cut the medium Spellbinders Hemstich Oval out of the natural paper for inside the card, to write a message on. I also needed something to hold up the easel which I created by stamping and embossing Congrats on the natural card stock and then die cutting it with one of the banners. Both came from the Spellbinders Oh Happy Day set. I am off to buy some more of the burlap packs as they are on sale right now for $1.99 a pack. I have included a link below if you are interested. Today I will be sharing four cards I made while creating with the Simon Says Stamp June 2018 Card Kit Fly Away and other products from my stash. I love the beautiful Flowers Stamp set from the kit. The main image is almost 4” x 7” in size -- huge! It comes with three matching flowers so that you can color and build up dimensional flowers on your projects. And some great sentiment builders in many different sizes -- I love the outlined words that you can color to match your project. This stamp set inspired each of the four cards I made with this kit. I really love the dimension created when you cut out this image and I decided to play with the papers in the same way. The patterned papers in this kit are wonderful whole but a few of them begged to be butchered. I used this stamp set as the main feature of my first card. Using the Simon Says Stamp masking paper from last month's kit, I created a mask of the main stamp. With such a large stamp, this did take a bit of time but this masking paper is sturdy so I know I will be able to use this mask more than once. My idea for this card was to create a top folding horizontal card with a partially cut out front. I stamped my first image on my card, applied the mask I had created, and flipped the card to stamp the image again. I then took some scissors and cut around the flower image to create this unique card front. It turned out exactly how I wanted it. 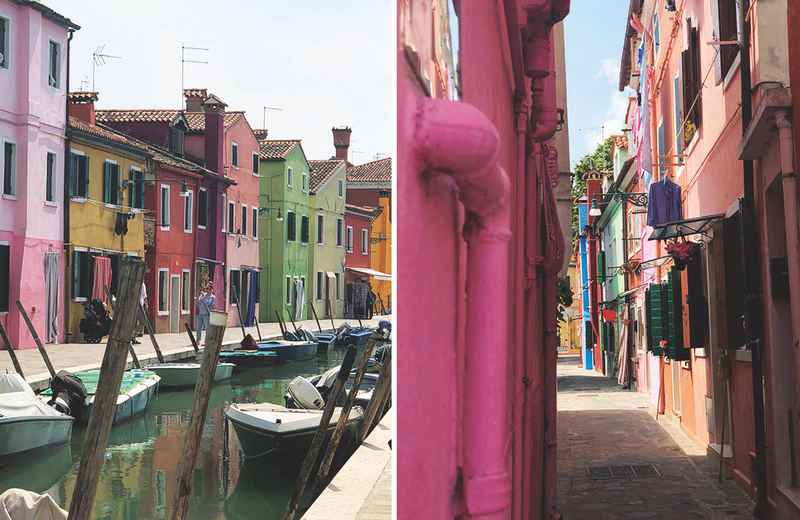 Interesting, dimensional, pretty, and fun! I did some quick Copic coloring on the image and background. To color the flowers, I colored several petals in the lightest shade, went in with my darkest color to highlight the darker areas that were easily found by the shading on the stamp, then applied some of the medium shade over the dark, flicking up to the light and then covering the entire image again with the lightest color to blend. I repeated this process for each flower and leaf until everything was colored and then added some stamens with my white gel pen and centers with an orange Copic marker. I used the same technique on everything but the background which I just colored in with the teal marker. For a sentiment, I chose the painted thanks die from Simon Says Stamp, I cut one from the Tonic Gold Pearl Mirror Satin card stock from the kit and another from white card stock. I placed the gold on the top of the card and the white on the inside directly behind the gold to provide support. I love how it hangs over the edge to create interest. This card wouldn’t have been complete without adding some Spectrum Noir shimmer pen to the pretty flowers of course. I embossed a white panel with the Tim Holtz Sizzix Botanical 3D Texture Fades Embossing Folder and attached it inside the card. I topped it off with a stitched oval (to write a message on) and applied some gold sequins (can be seen when the card is open or closed) around the floral arrangement. My second card is a 6" x 6" card made with this beautiful piece of patterned paper. Like my first card, I wanted to cut the images out to pop them up on the card to create shadows and dimension. 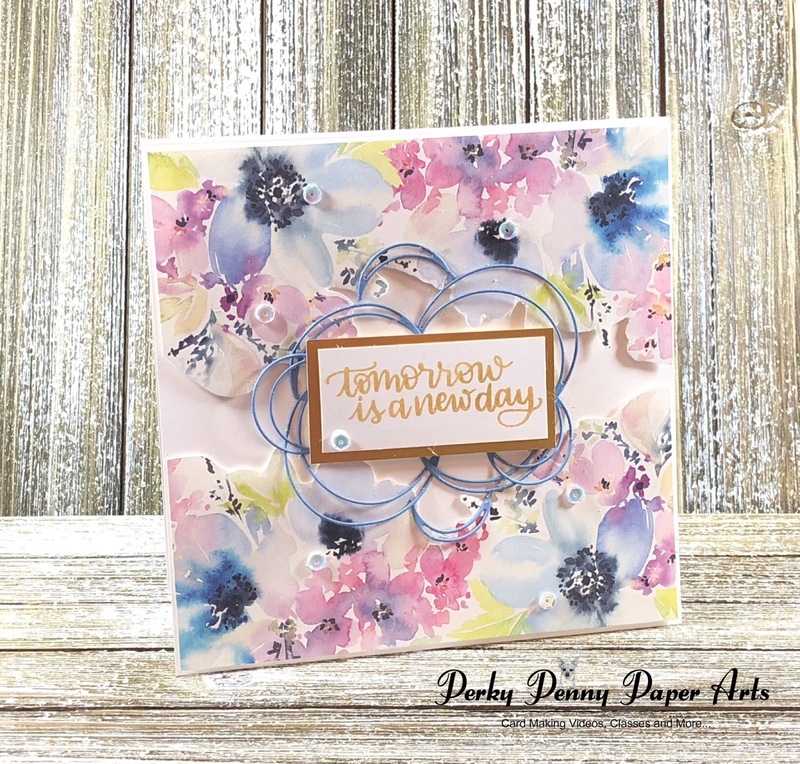 I stamped the sentiment “Tomorrow is a New Day” from the Simon Says Stamp Hand Lettered Encouragement set on white card stock with Gold Delicata Ink and cut a slightly larger rectangle of the Tonic Gold Pearl paper to frame it. This month I also ordered these fun Circle Loop dies. I can see so many uses for them. For this card, I used I cut two sets out of the Cornflower Blue card stock. I took my 6" square card base and attached the two patterned pieces to either side of the top and bottom of the card using 3M foam tape. Because I had cut the middle out, I was able to position these to allow for a small border without any additional trimming. 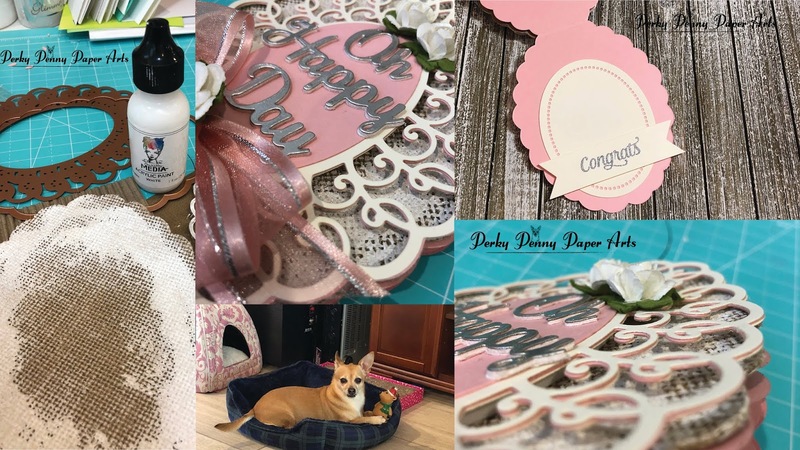 I then took my sentiment and, after gluing it to the frame, I created a double layer of foam tape so that the sentiment would be another layer above the patterned paper. And now for my circle loops. I decided to try cutting them in half which created these adorable half moons that I then positioned around the sentiment. Gluing them was a little tricky as they are so thin. I solved the problem by just putting glue on the tips that I then hid under the sentiment. To add some shine, I finished the card with some iridescent sequins around the card -- just the right touch. I love the size of this card and the elements I included but it still feels like it is missing something. I think if I had to do it over again, I would add a small cornflower blue border around the cut edge of the flowers to help them pop more. Let me know your suggestions in the comments below. The next pattern that I worked with is this beautiful hot air balloon with a spray of flowers just begging to float across my card. Using a paper trimmer, I cut up to the edge of the bottom of the image on both sides and then fussy cut out the flowers and basket. Then I cut a straight line just above the top of the hot air balloon. I trimmed the piece down to 5 1/2” wide so it would fit on a top-folding horizontal card. To make the panel pop, I applied a sliver of gold to the top and bottom using dotted tape runner applied to the very edges of the underside of the panel and trimmed the ends. Before removing the foam tape backing and attaching the panel to the card base, I used it in my MISTI to position the sentiment from the Beautiful Flowers stamp set that would be under the panel. I then removed the panel and stamped the sentiment in Gold Delicata ink. I removed the backing paper and adhered the panel to complete card # 3. This was quick and simple at its best. 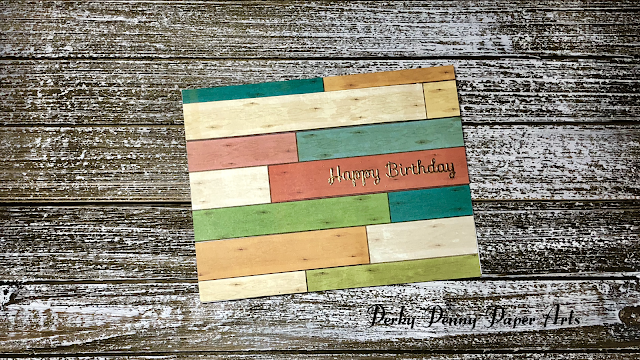 Card # 4 features two different papers from the kit. I fussy cut the balloons out of one and cut a 5 1/4” x 4” panel out of the watercolor paper, focusing on the pink/purple portion. My white mat is a simple piece of copy paper trimmed down to 5 3/8” x 4 1/8”. 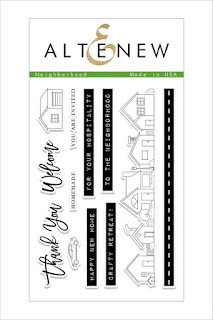 I cut this fun Thanks (On A Line die from Simon Says Stamp) three times out of card stock and glued them together to create a sturdy sentiment for the front of my card. I then attached the large hot air balloon top behind it to start my configuration. Using a combination of the hot air balloons and some clouds die cut out of white paper, I put together a scene of varying levels of clouds and balloons. I blinged out this card with some more of the Spectrum Noir shimmer pen on the clouds. I wish you could see how shiny they are. This card turned out beautifully.